8260 ft (2518 m) . Taranaki (also known as Mount Egmont) is New Zealand's largest and most spectacular volcano, and is easily one of the most beautiful volcanic cones anywhere in the world. 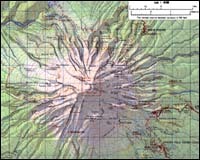 The graceful symmetry of the main cone is further enhanced by the satellite cone of Fantham's Peak which is embedded in its southern side, much as the form of Mount Shasta is enhanced by the presence of Shastina. The present cone of Taranaki was probaly constructed only in the last 10000 years, although lava flows from older stages of the volcano form a broad ring plain which slopes all the way to the ocean 15 miles (25 km) away around the perimeter of the Taranaki peninsula. This gives the Taranaki volcano a much larger volume than the somewhat higher Ruapehu. 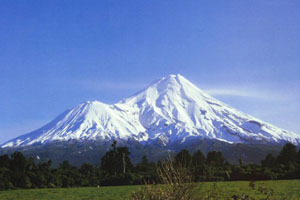 The cone of Taranaki holds no glaciers, although a few small permanent snowfields are found on the upper slopes and in the summit crater. 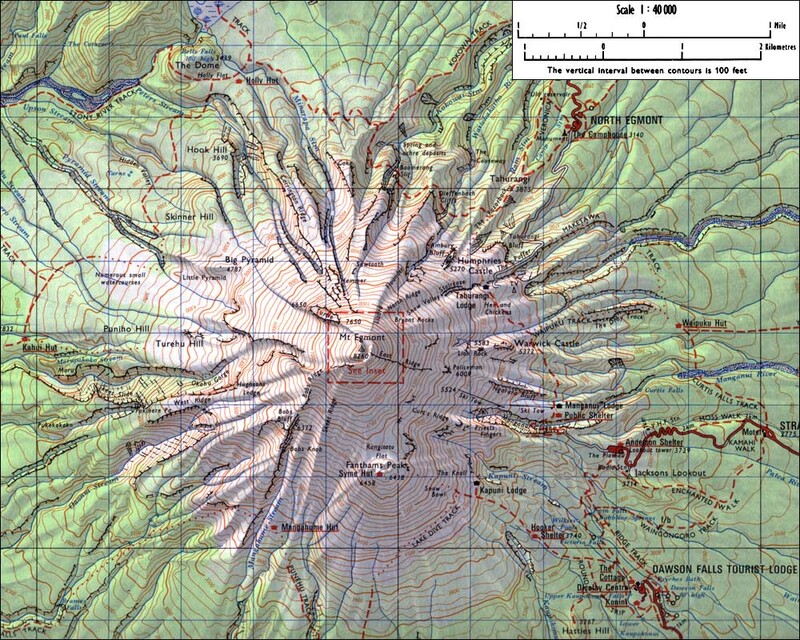 The true summit is a lava dome in the middle of the crater, which is breached to the west. A small ski field, Manganui, is located on the eastern slopes, and the standard climbing route ascends from there to the crater rim. With the symmetry of the cone, spectacular ski descents are possible down almost any flank.